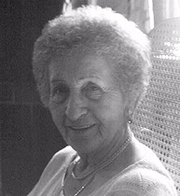 Rena Kornreich was born to a Jewish family in Voivodeship, Poland. She and her three sisters, Gertrude, Zosia and Danka, grew up in Tylicz. Gertrude emigrated to the USA in 1921. After the Nazi invasion of Poland in World War II, the family fled to Slovakia. To protect the people hiding her, Rena turned herself in. At age 21, she was on the first transport of Jewish women into the concentration camp at Auschwitz on 26 March 1942. Three days later, she was joined by her younger sister Danka. The sisters endured forced labor, hunger, and abuse, and narrowly escaped Nazi experimentation for three years in the camp. In January 1945, they were sent on a death march to the Ravensbrück concentration camp and then put on coal cars for transport to Germany for more forced labor. They survived and were liberated by Russian and Allied troops in May in Neustadt Glewe, Germany. Their parents had been murdered in Auschwitz but the fate of Zosia and her children was unknown. In 1947, Rena married John Gelissen, commander of the Dutch Red Cross relief team that had given her and her sister food and shelter at the end of the war. In 1954, Rena and her family emigrated to the USA, settling in Norwalk, Connecticut. Danka and her husband Elias Brandel also came to the USA. With writer Heather Dune Macadam, Rena told the story of her experiences in a memoir called Rena's Promise: A Story of Sisters in Auschwitz, published in 1995. Rena Kornreich Gelissen's book Rena's Promise was available from LibraryThing Early Reviewers. Rena Kornreich Gelissen is currently considered a "single author." If one or more works are by a distinct, homonymous authors, go ahead and split the author. Rena Kornreich Gelissen is composed of 2 names. You can examine and separate out names.